The vulnerability resides in the Cluster Management Protocol (CMP) processing code in Cisco IOS and Cisco IOS XE Software. If exploited, the flaw (CVE-2017-3881) could allow an unauthenticated, remote attacker to cause a reboot of an affected device or remotely execute malicious code on the device with elevated privileges to take full control of the device, Cisco says in its advisory. The CMP protocol has been designed to pass around information about switch clusters between cluster members using Telnet or SSH. The vulnerability is in the default configuration of affected Cisco devices, even if the user doesn't configure any cluster configuration commands. The flaw can be exploited during Telnet session negotiation over either IPv4 or IPv6. So, in order to exploit this vulnerability, an attacker can send "malformed CMP-specific Telnet options while establishing a Telnet session with an affected Cisco device configured to accept Telnet connections," researchers say. This exploitation could allow the attacker to remotely execute malicious code and obtain full control of the affected device or cause a reload of the affected device. 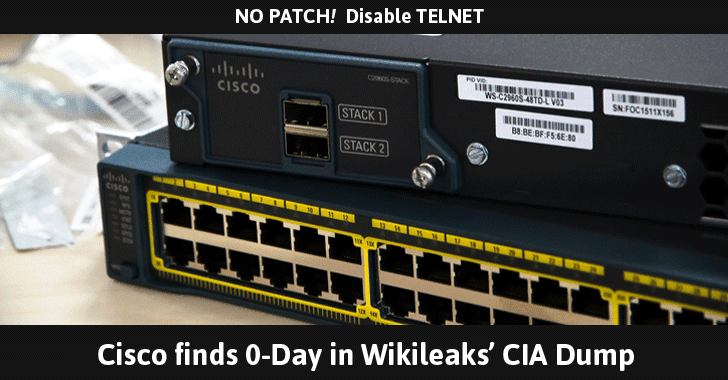 Currently, this vulnerability is unpatched, and until patches are available, Cisco recommends its users to disable the Telnet connection to the switch devices in favor of SSH. The company's advisory doesn't talk about any working exploit using this flaw, but if there's one, tens of thousands, if not hundreds of thousands, of devices installed around the world look to have been at great risk for an unknown period — Thanks to the CIA for holding the flaw. Cisco will update its IOS Software Checker tool immediately as soon as the patches come out.